A comprehensive condition assessment of nine dams owned by the city of San Diego has been underway for the past year, the Public Utilities Department said Monday. Asked about the condition of San Diego dams after Sunday’s mass evacuation in Oroville in Northern California, department officials told City News Service that they hired independent experts in dam design, construction and safety to perform detailed inspections of the dams in February of last year. The inspections include analyzing dam condition, confirming seismic safety, recommending necessary repairs or maintenance, and prioritizing any work based on risk, including cost estimates for all recommended work, they said. The inspections are being overseen by city staff and the state Water Resources Department’s Division of Safety of Dams. A report is expected four years from now. City personnel inspect San Diego’s dams on a weekly basis for things such as erosion, leaks or anything that could compromise the integrity of a dam or spillway, such as brush and tree growth, rodent holes and fallen boulders; cracks are measured monthly, according to the Public Utilities Department. Staff also patrol and safeguard dam and reservoir areas against trespassers and livestock. “They clean, maintain and repair flumes, sand traps, blow off valves, vaults and other reservoir and dam related facilities,” department officials said in an email. Area dams are inspected by the Division of Safety of Dams each year. Some of the dams operated by the city are those at the San Vicente and El Capitan reservoirs, Lake Morena — all in the East County — and Lower Otay Lake, just east of Chula Vista. Those bodies of water have the greatest capacity among city reservoirs. 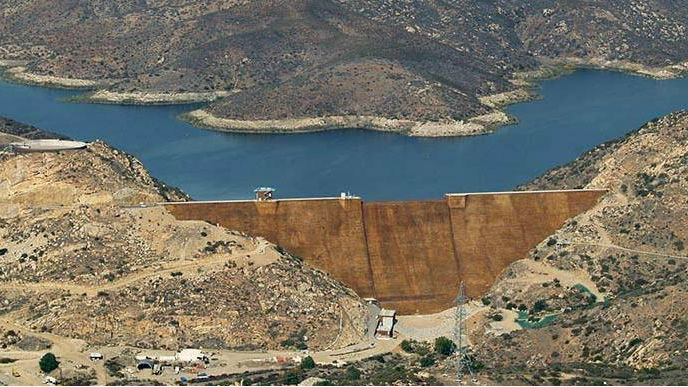 The San Diego County Water Authority operates one dam, the Olivenhain Dam in the North County. In all, there are 54 dams in San Diego County, owned by 19 public agencies. Inewsource, a collaboration between KPBS and San Diego State University, reported last May that the Division of Safety of Dams records showed they were all judged to be safe for continued use.